Definition at line 84 of file Redeclarable.h. Definition at line 290 of file Redeclarable.h. Definition at line 197 of file Redeclarable.h. Definition at line 215 of file Redeclarable.h. Referenced by clang::ASTContext::addCopyConstructorForExceptionObject(), clang::Sema::BuildVarTemplateInstantiation(), clang::getCanonicalForwardRedeclChain(), clang::ASTContext::getCopyConstructorForExceptionObject(), clang::ASTContext::getInlineVariableDefinitionKind(), clang::Redeclarable< VarDecl >::getMostRecentDecl(), clang::Sema::InstantiateVariableInitializer(), clang::Sema::isEmptyCudaConstructor(), clang::Sema::isEmptyCudaDestructor(), clang::Mergeable< UnresolvedUsingTypenameDecl >::isFirstDecl(), isImportedDeclContext(), clang::ASTContext::isMSStaticDataMemberInlineDefinition(), clang::Sema::MaybeSuggestAddingStaticToDecl(), clang::ASTContext::setNonKeyFunction(), clang::ASTDeclWriter::VisitCXXMethodDecl(), clang::ASTDeclWriter::VisitEnumDecl(), clang::ASTDeclReader::VisitNamespaceDecl(), clang::ASTDeclWriter::VisitRecordDecl(), clang::ASTDeclWriter::VisitRedeclarable(), clang::ASTDeclWriter::VisitTypedefDecl(), and clang::ASTDeclWriter::VisitVarDecl(). Definition at line 219 of file Redeclarable.h. Returns the most recent (re)declaration of this declaration. Definition at line 225 of file Redeclarable.h. Referenced by clang::ASTContext::adjustDeducedFunctionResultType(), clang::CodeGen::emitDeclareSimdFunction(), clang::ASTContext::forEachMultiversionedFunctionVersion(), getMangledNameImpl(), clang::Sema::InstantiateFunctionDefinition(), clang::Sema::MarkFunctionReferenced(), clang::Sema::MergeVarDecl(), clang::Sema::PerformPendingInstantiations(), clang::CodeGen::CodeGenModule::SetCommonAttributes(), ShouldRemoveFromUnused(), clang::ASTDeclWriter::VisitTypedefDecl(), and clang::ASTDeclWriter::VisitVarDecl(). Definition at line 230 of file Redeclarable.h. Definition at line 189 of file Redeclarable.h. Referenced by clang::Redeclarable< VarDecl >::getPreviousDecl(). Definition at line 203 of file Redeclarable.h. Referenced by clang::ASTDeclReader::attachPreviousDeclImpl(), clang::Sema::BuildVariableInstantiation(), clang::Sema::CheckCompleteVariableDeclaration(), clang::Sema::DeduceVariableDeclarationType(), dumpPreviousDeclImpl(), clang::CodeGen::emitDeclareSimdFunction(), clang::RedeclarableTemplateDecl::getCommonPtr(), clang::NamedDecl::getExplicitVisibility(), getExternalLinkageFor(), clang::Redeclarable< VarDecl >::getPreviousDecl(), clang::ADLResult::insert(), clang::Sema::isAcceptableTagRedeclaration(), PreviousDeclsHaveMultiVersionAttribute(), redeclForcesDefMSVC(), clang::Sema::SetDeclDeleted(), ShouldWarnAboutMissingPrototype(), clang::TemplateDeclInstantiator::VisitCXXMethodDecl(), clang::TemplateDeclInstantiator::VisitFunctionDecl(), clang::ASTDeclWriter::VisitParmVarDecl(), clang::ASTDeclWriter::VisitRedeclarable(), and clang::ASTDeclWriter::VisitVarTemplatePartialSpecializationDecl(). Definition at line 208 of file Redeclarable.h. True if this is the first declaration in its redeclaration chain. Definition at line 222 of file Redeclarable.h. Referenced by clang::ASTDeclReader::mergeRedeclarable(), clang::ASTDeclWriter::VisitClassTemplateDecl(), clang::ASTDeclWriter::VisitFunctionTemplateDecl(), clang::ASTDeclWriter::VisitRedeclarableTemplateDecl(), and clang::ASTDeclWriter::VisitVarTemplateDecl(). Definition at line 170 of file Redeclarable.h. Definition at line 166 of file Redeclarable.h. Referenced by clang::ASTDeclReader::mergeRedeclarable(), and clang::ASTDeclReader::VisitRedeclarable(). 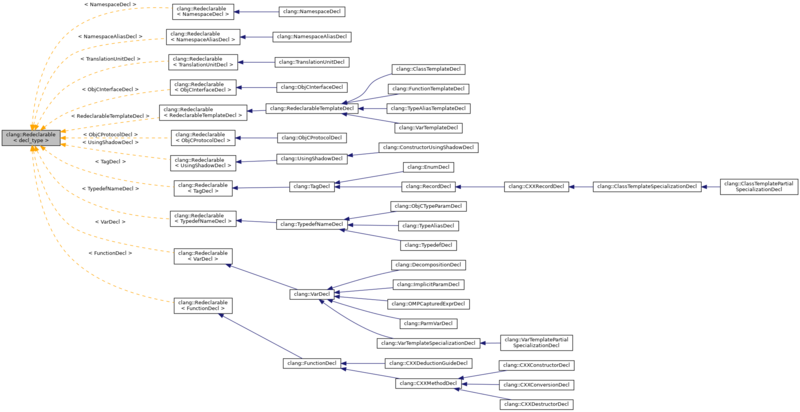 It will iterate at least once (when this decl is the only one). Definition at line 294 of file Redeclarable.h. Referenced by clang::Sema::CheckForFunctionRedefinition(), clang::CodeGen::CGDebugInfo::completeUnusedClass(), clang::VarDecl::getActingDefinition(), clang::VarDecl::getDefinition(), clang::ASTContext::getInlineVariableDefinitionKind(), getInterestingTagDecl(), hasAnyExplicitStorageClass(), clang::VarDecl::hasDefinition(), clang::Sema::InheritedConstructorInfo::InheritedConstructorInfo(), clang::Sema::isAcceptableTagRedeclaration(), clang::Sema::MarkFunctionReferenced(), clang::Redeclarable< VarDecl >::redecls_begin(), clang::Redeclarable< VarDecl >::redecls_end(), clang::CodeGen::CodeGenModule::SetLLVMFunctionAttributesForDefinition(), clang::Sema::UpdateExceptionSpec(), and clang::TemplateDeclInstantiator::VisitFunctionDecl(). Definition at line 300 of file Redeclarable.h. Definition at line 301 of file Redeclarable.h. If PrevDecl is NULL, set this as the first and only declaration. Definition at line 4295 of file Decl.h. 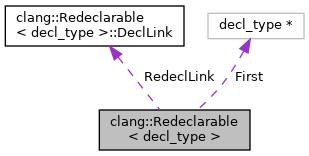 Referenced by clang::Redeclarable< VarDecl >::getMostRecentDecl(), clang::TemplateDeclInstantiator::InstantiateEnumDefinition(), clang::TemplateDeclInstantiator::InstantiateTypedefNameDecl(), and clang::Sema::MergeVarDecl(). Definition at line 194 of file Redeclarable.h. Definition at line 195 of file Redeclarable.h. Definition at line 187 of file Redeclarable.h. Referenced by clang::ASTDeclReader::attachPreviousDeclImpl(), clang::Redeclarable< VarDecl >::getFirstDecl(), clang::ASTDeclReader::mergeRedeclarable(), and clang::ASTDeclReader::VisitRedeclarable(). Points to the next redeclaration in the chain. Definition at line 185 of file Redeclarable.h. Referenced by clang::ASTDeclReader::attachLatestDeclImpl(), clang::ASTDeclReader::attachPreviousDeclImpl(), clang::ASTDeclReader::getMostRecentDeclImpl(), clang::ASTDeclReader::markIncompleteDeclChainImpl(), clang::ASTDeclReader::mergeRedeclarable(), and clang::ASTDeclReader::VisitRedeclarable().